MANA Nurse Practitioners | Mid-Atlantic Nephrology Associates, P.A.
) and are licensed through nursing boards rather than medical boards. At MANA we have a team-oriented approach when it comes to medical care. 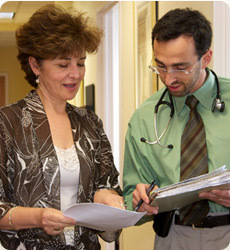 The team consists of a physician, a nurse practitioner, and the patient. Nurse practitioners work closely with physicians to establish treatment plans and can be responsible for follow-up visits with patients. Having highly trained nurse practitioners as part of the care team allows for our patients to have greater access to their healthcare professionals. Renal biopsy is recommended for selected patients with kidney disease. It is most commonly performed when less invasive measures are insufficient.